I’m hauling up to Novato for an appearance this coming Saturday, and a couple of weeks later you can track me down in Livermore. On Sunday February 16, 2p.m. 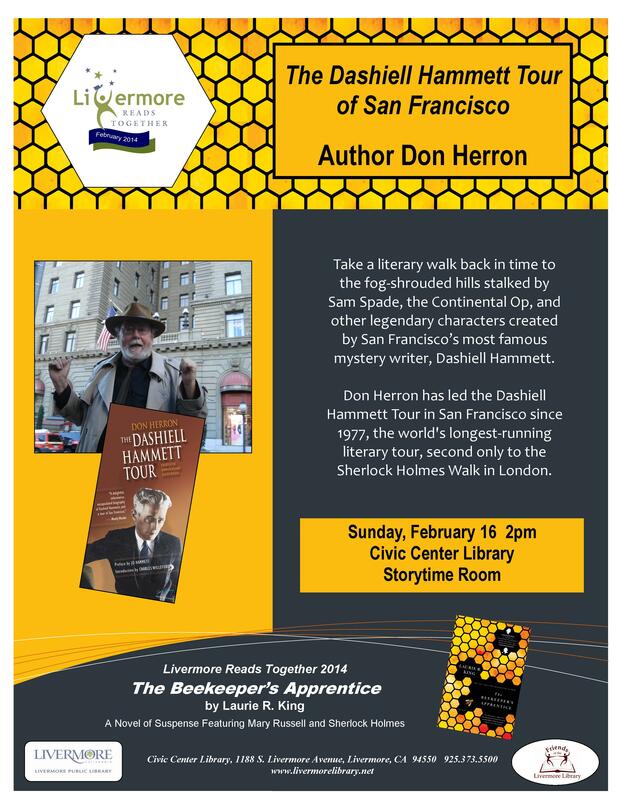 in the Storytime Room of the Civic Center Library, you’ll find me on hand to present the tour via a power point slideshow for the eighth annual Livermore Reads Together (which I guess is like a Big Read, only just for Livermore). Instead of four hours, it’ll last about an hour or so. Instead of burning the soles off your gumshoes on the mean streets you’ll be able to sit in a chair, even fall asleep if so inclined. And it looks as if the deal is free. Man. The notoriously brutal Dashiell Hammett Tour doesn’t get any easier than that, does it? This entry was posted in News, Tour and tagged Big Read, Livermore Reads Together. Bookmark the permalink.